Optimising hard disks and cleaning them up is an essential PC process. Why Windows' native products are so poor is anyone's guess, but a dedicated solution is always better. O&O Defrag has been a leading product for years and version 10 is every bit as efficient, while sporting a brand new look and feel. What's important is speed, accuracy and security of data, and O&O excels in all these areas. 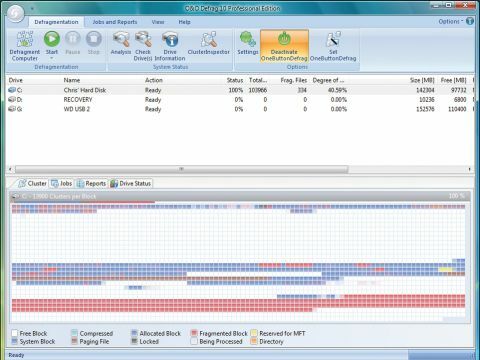 It's one of the fastest tools we've used: even a drive fragmented to nearly 30 per cent took minutes rather than hours to fix, starkly illustrating the patchiness of Vista's scheduled defrag process. The software defragments internal and external hard disks and, when required, also checks the volume for errors before a large-scale clean-up session. As attractive as the O&O Defrag graphical representation of your drive is, it falls flat in other areas of the central interface. Options are quite confusing, with an array of preferences apparently doing the same thing. Clearly inspired by Office 2007, the interface should be relatively straightforward, but we were left wondering why so much information was necessary for a simple analysis and defrag process. You can spend an inordinate amount of time in the online help section figuring out what approach to use. There are five defrag types: Stealth, Space, Complete (Access), Complete (Modified) and Complete (Name), all of which cover some of the same ground as the method before, particularly in Complete mode. Stealth and Space are likely to be most popular options, particularly for periodic defragmentation. Defragment Computer is a welcome option that defrags all drives at once, including externals, as is the novel option of Screensaver Mode, which defrags your computer when it's idle. The detail on offer is second to none, and if you're regularly defragging large volumes (Complete mode), this product is highly recommended. Yet despite the power on offer, O&O's efforts to simplify the defrag process for home users have unfortunately been in vain.